In all seriousness, his journal entries so far are dead-on correct. 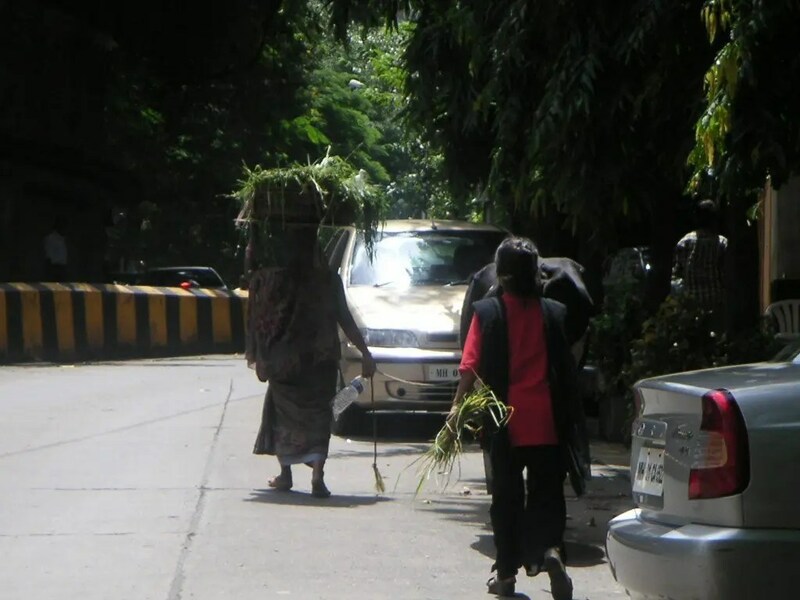 I’ve been building up to address the poverty that I see every day in Mumbai, but was waiting to compose my thoughts. Plus, of course, I don’t want to scare anyone from coming to visit me. But here’s a little slice of my daily views and dealings with the everyman outside of the gates. Get a ride to work. Some men that are working the construction site nearby are waking up under a blue plastic roof. There are already some people, mostly children, picking through the dumpster. It’s recycling, India-style. At the intersection, it doesn’t matter which way I look – left, right, or straight in front of me – there are people, whole families sleeping on medians and under overpasses. Children this poor and under the age of, say, 5, are usually not clothed from the waste down. One-year-olds crawl around on concrete, while children as old as probably three or four are still nursing. 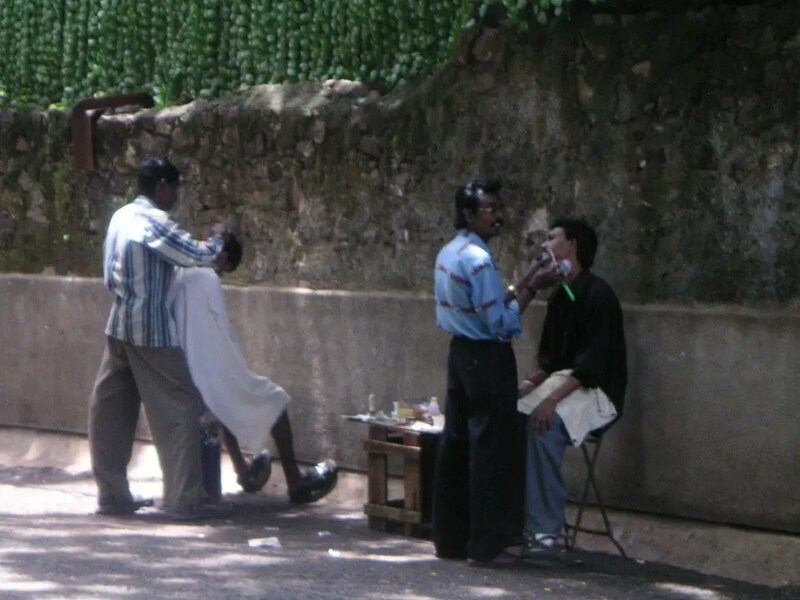 If I’m out in the city, maybe I’ll see things such as makeshift barber shops set-up on the sidewalk. The one in the pic above was the first one I saw, and it’s actually a rather posh affair in retrospect when I compare it to others I’ve seen. If you’re in certain parts of the city in the afternoon, say the Haji Ali Mosque or Grant Road Market, you may come across some of the crippled or deformed. For example, we alighted from a taxi the other day near the bazaar, and the first person who came up to us was a lady with one arm. No big deal, right? Well, no, not unless you enjoy looking at raw nubs, most certainly infected from bug and rat bites. Rush hour time is begging time, and is when you’ll see the swarms of children rushing through traffic trying to get you to give them a chocolate, money, anything. It’s an unwritten rule that you don’t give to these children for a couple of reasons: 1) because they are most certainly organized by an adult who will take all the money and/or food that the children get from begging and 2) because, in India, where there’s one, there are thousands, and you just can’t begin to provide for them all. I will go one better than Stevenson and mention a few aid organizations that operate in India. They say that giving to these orgs is the best way to insure that money goes to children and not to gang leaders. I have the best intentions of volunteering my time with one of these orgs down the line, but, in the interim, I know a donation will help. You have to remember: $1 can pay an entire day’s wages here. A really good salary is $10,000 per annum. So there’s a good chance you can make a huge difference. Finally, last night, I was speaking to some new South African friends — one black, one white — about the poverty, the caste system, and the culture in India, as we were all fairly new here and still completely conflicted, shocked, appalled, etc. Correct me if I’m wrong, but South Africa is known to have some pretty harsh slums. So when two people from that country admit that the poverty of India is some of the worse they’ve ever seen, then you have to figure that it really is. People come to Mumabi with dreams of becoming millionaires the same way people head to NewYork or Hollywood or SanFrancisco or urban Americas. Tragedy of urbanization in 20th & 21st century. Mahatma Gandhi once said ” There is ENOUGH on this PLANET for everyones NEED but not for everyones GREED”. Unfotunatley winds on this planet blow from west to east literally & figuratively.Indians for sometime now have been engulfed in the flames of materialsm and engrossed at copying what ever they see on the color screen in their living rooms or whatever west throws at them. Copying without scrutiny always leads to disastourous consequences…you can try it yourself or may be you have already experienced it!! You mentioned about Sri Krishna in one of your blogs; you can have online access to his commentry “http://www.bhagavad-gita.org/”. What he conveyed will be ever relevant. Do visit “Bharatiya Vidya Bhavan” at Chowpaty or Marine Drive; you will get very good books on everything Indian at a very reasonable price.